The Funky Felter: Etsy's Fiber Arts Street Team Sale and Trunk Show Extravaganza! Etsy's Fiber Arts Street Team Sale and Trunk Show Extravaganza! 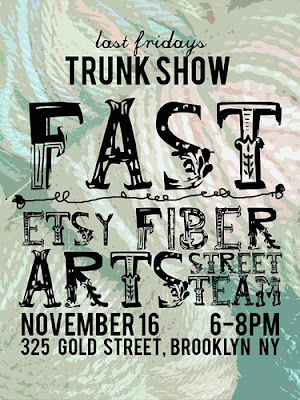 Etsy's Fiber Arts Street Team has a trunk show coming up on November 16th at the Etsy Labs in Brooklyn. In honor of our upcoming team show, FAST is having a team-wide sale with many participating members. Please read more about the trunk show on our team blog and find a complete list of participating sale shops and discounts there too!